The Time Has Come. How do we prepare for the end of the end-times we are living in? The ‘rapture-rescue’ plan is a lie because it is certain that we are already going through the “Great Tribulation” that is going viral right now, and Jesus Himself emphatically stated He will only return once, and that will be “AFTER the great tribulation,” (Mt. 24:29-31.) Meanwhile, many believers think we must follow “doomsday preppers;” hide in fortified bunkers, and stock up water, food, and medicine (oxygen too!) until the ‘apocalypse’ is ‘past.’ Well, the apocalypse will only be swallowed up with fire when Jesus returns… (2 Pt. 3:10-14.) So, should we use our brains and flee if we can? Yes – but only in the guidance of the Holy Spirit, while we must realize that physically, there is really nowhere to flee to because the apocalypse is global, (Mt. 24:16-22.) The only flight left is spiritual and emotional, as in fleeing to higher ground through faith in Jesus, and growth in, and obedience to the truth of His Word. Is it sin to hoard water and food? Believers must not hoard in unbelief and desperation. Yet, to store necessary supplies within reasonable amounts is a good idea while living under communist threat. We must take care of our physical needs while we can. Must we defend ourselves when attacked? Of course, as far as possible, (Ex. 22:2-3.) Our physical lives here on earth is also a precious gift from God. As for the rest, we must trust the Most High Creator God to take care of us and our loved ones. 1. Know and understand that Jesus is God Himself; the Beginning and the End, Who Is, Was, and Is to Come [at His return on the clouds, or when He calls us through death,] the Alpha and Omega, the Lord God Almighty;” the Creator God of the Bible and Keeper of His entire Universe, (Rev. 4:8; 1:8; Heb. 1:1-14.) Jesus is able to carry all those who belong to Him and rely on Him through the water, fire, mayhem, and murder that are rampant on the earth. The fact that each one of us is here, right now, on this troubled, sin-destroyed planet, is no coincidence. Jesus is the One Who oversees it all. Follow Jesus through the water baptism of disciples as an open declaration of the spiritual rebirth in your ‘heart,’ and to bury the old man of sin and to rise in a new life in Christ, (Rom. Chapter 6; Mt. 28:19-20.) Reject and forsake all false doctrine, churches, man-made interpretations of the Word, and those who block your life in Christ. Then, submit and dedicate yourself spirit, soul, and body, (1 Ths. 5:23,) your whole life, everything and everyone God had entrusted to you, your time, finances, and talents to our Father Who is in heaven. Seek now, while there is still time, the entire truth of the Scriptures. Make it yours. Live in it. Obey the Moral Law commandments of the New Covenant. 5. Understand, and face the truth of Scripture and the truth about what is really going on in your own life, and in the whole world, so that you will be able to really have empathy with others who are suffering, and thus also have a burden for the lost. As always under all circumstances, “the truth will set us free.” If not physically, then spiritually and emotionally – which is the most important part of liberty in Jesus. 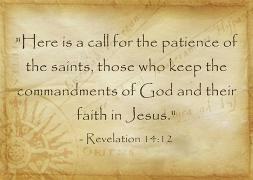 Those who do not have true faith in Jesus run and hide in times of trouble. Real believers in Jesus obey Him to stand as calm, truth-speaking, Scripture-obeying, prayer-interceding witnesses to Him as the Living God of the entire universe. This is crunch-time for those who profess the Name of Jesus. We can only be brave when we have nothing to lose because it all belongs to Jesus. 6. True believers are Jesus’ own, blood-bought, saved, delivered, and blessed ones, who live inside His Spiritual Kingdom here in this dark dimension, (1 Pt. 2:9-10.) They were “called out of darkness” to shine His marvelous Light: His truth, hope, faith, and practical love in truth and deed. Life in Christ is as Paul cried out under life-threatening persecution in Rom. 8:38-39, “I am persuaded, that neither death, nor life, angels, principalities, powers, things present, things to come, height, depth, nor any other creature, shall be able to separate us from the love of God, which is in Christ Jesus our Lord.” Hallelujah! Where will we Flee to Escape what is coming upon us in the whole world?